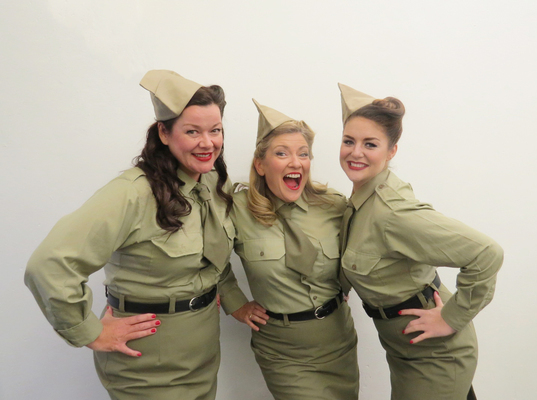 HELLO SOLDIER: Great Songs of the War Years comes to GPAC for Musical Mornings. Musical Mornings return to Geelong Performing Arts Centre (GPAC) next month with local favourites and brand new shows. The second season of the ever-popular music series kicks off on 11 July with Melbourne’s swingin’ B Sharp Big Band featuring Tamara Kuldin. Kuldin joins the band for a concert of classic arrangements from the 30s, 40s and 50s by Anita O’Day, Ella Fitzgerald, Peggy Lee, Doris Day and other swingin’ chanteuses. Then in August GPAC goes Bach to Broadway with Australian star tenor Bradley Daley and international soprano Alison Jones. The concert crosses over from opera and musicals to folk songs and jazz, plus Broadway classics. In September Simon Gleeson will present a concert for musical theatre lovers with Bring Him Home. The award-winning West End performer sings the songs that made his career, including Bring Him Home from Les Mis¨¦rables. Then in November GPAC celebrates the centenary of the cessation of WWI with Great Songs of the War Years. The show features 20 songs songs from the Andrew Sisters, Vera Lynn and more, plus a tribute to the Vietnam War with music from Bob Dylan and Normie Rowe. To wrap up the season, one of GPAC’s most popular performers, Silvie Paladino, will return to the Playhouse to delight audiences with her Christmas concert. Season Two subscriptions are available, saving $10 off the full price of all five shows and ensuring the best seats in the house. Phone GPAC Box Office on 5225 1200 to arrange a subscription.